Jonathan Ornstein began his career in 1987, working at Los Angeles-based Air LA, a small commuter carrier where he did everything from finance to aircraft cleaning. 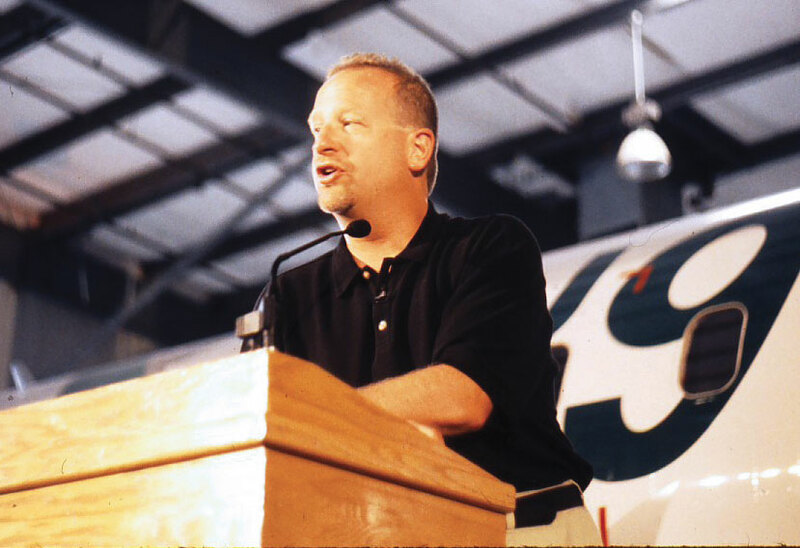 He moved over to Mesa Air in 1989, where he served as assistant to founder, president and CEO Larry Risley. He worked his way up to executive vice president, and then became president and CEO of Continental Express and senior vice president of airport operations for Continental. He then moved to Brussels, Belgium, to work with Sir Richard Branson to create Virgin Express. Ornstein returned to Mesa in 1998 after the company experienced heavy financial losses and a deteriorating operational performance. He put the company back into the black, only to end up in Chapter 11 bankruptcy protection 12 years later. He spoke about where the regional industry has been, and about Mesa’s future place in it. You’ve been in the regional industry for 25 years. How has it changed between then and now? The industry has become far more sophisticated. The level of complexity is much higher, from the type of equipment we operate–going from Beechcraft C99s to Bombardier CRJ900s–to a more regulatory environment. In the old days, we had so much more flexibility. We ran our own schedules, set our own fares and managed our own inventory. These days, we don’t do any of that. Right now, cost is king in terms of competing. The bigger issue is that the whole industry is faced with difficult, complex issues revolving around [50-seat] aircraft with leases longer than their economic life. For example, maintenance expenses that have far outstripped what people had originally planned. Most overhauls are tied to the precious metal index. What has that done in the past 10 years? We don’t have the risk of fuel, but we still have other costs to maintain, which is why you see so many 50-seaters parked these days. No one is willing to overhaul engines anymore. The business model for regional airlines has changed dramatically. I remember when Mesa got its first 50-seat jets in 1997. I was talking with some of our old-time pilots who were excited. I remember telling them that they were looking at the [Fairchild] Metros of the future. The regional airline industry seemed to hit a turning point downward in 2006. What do you think drove that? The fact that we all signed 16- to 18-year leases with 10-year contracts, which are mismatched assets. We all thought we had these great airplanes and that our major airline partners would still want them 10 years later. Comair was the first regional airline to get regional jets and look at them now–nearly liquidated. Mesa was next. We’ve made mistakes and one of them was not to invest in US Airways in 2002. Instead, we moved 30 aircraft to United and 36 aircraft to Delta because we felt these deals were well worth it for our future. When we did the deal with United, we knew we were seeing escalating maintenance expenses, but we underbid it anyway. We should have said we couldn’t do it. Maybe we should have parked the 30 aircraft. Instead, we chose to find homes for them and keep the company intact. When you returned to Mesa in 1998, the carrier was on the edge of filing for Chapter 11, but you were able to avoid that. What do you feel was the difference between 1998 and the need to file in January 2010? Back then, we had more control over our destiny. Our contracts weren’t cost-plus and we could negotiate our way out of aircraft leases. We were able to get rid of 32 Beech 1900s to Doug Voss [of Great Lakes Airlines]. Back then, our assets had value. Looking at our Chapter 11 filing in 2010, in the old days, we could have made a deal. We actually did that at Continental Express. But Bombardier gave guarantees to lessors to backstop the regional jet deals so that if Mesa failed, they would still get paid. Our lessors actually told us that they preferred that we file so they could get money from Bombardier, because it was more than the aircraft were worth. If there had been a market for 50-seat regional jets, we would not have filed. We would have subleased them, but there was no market for them. I fought it for 18 months, then filed. During the Chapter 11 process, how did you and your team balance the need to shed costs, the need to rework your airline contracts and the need to keep up the spirits of the workforce? We knew our issue was a technical bankruptcy. It wasn’t like our business didn’t work. We made money on the airplanes we operated. But it was about getting rid of the 50-seaters. A huge part of the operation was working on matching aircraft to lessors and returning them. We walled that off and told our employees that it was important for them to do a great job, because it will save our business. So we never missed a beat. The people still here have been instilled with the pioneer spirit that goes back to the days when Larry Risley operated the airline. Our most senior people are the most positive. We still have pilots who were here when we flew C99s and Cessna Caravans. They didn’t get depressed. They rallied after we explained why we did the bankruptcy filing. We also remained open and transparent with our creditor committee. There were folks out there who came in taking an aggressive stance toward management. But they saw we were trying to do the right thing, appreciated our transparency and became our allies. It helped that we had Bombardier and Embraer on our creditor committee. They understood the dynamics of the industry, which was helpful. As part of Mesa’s emergence from Chapter 11, US Airways owns 10 percent of the company, and you have 46 CRJ900 regional jets you fly for them. You also fly 20 CRJ700s for United. How worried are you about having so many aircraft eggs in one basket? What I worry about is that our contracts have expiration dates. I would like to see them extended and generate new business with our partners. This is an important goal. I also have to hope that our remaining aircraft continue to have economic value. If the operating economics on the CRJ900s don’t work, airlines won’t fly them. I have to believe that the CRJ700s and CRJ900s have long-term value. But if fuel rises to $150 a barrel, then they won’t. Currently with all the changes in the industry, the demand for 70- and 90-seaters will be strong, but it’s almost impossible to finance them these days. Aircraft will become a lot more expensive because lessors won’t take the risk anymore, like doing 18-year deals on 10-year assets. I’m not blaming anyone, because everyone was doing it. In a memo to employees in February, you wrote that Mesa, like other airlines, was signing deals that will never be profitable simply to “live to fight another day.” How long can you operate like that? You can’t. It’s not sustainable by any stretch. It’s what we did with United Airlines when we moved those 30 aircraft over there, but we didn’t know it then. We have five aircraft coming off contract with United next June, but we extended it for five years in a deal that was attractive for them, but not as much for us. But I felt we could do this five-aircraft deal. It was better than parking the aircraft. As even larger airline groups like SkyWest and Republic see shakier bottom lines, how does that bode for Mesa? On what terms would you consider a merger or even an acquisition? Acquisition is still a possibility. We are smaller, so I can imagine a scenario doing a merger and seeing our cost structure becoming better. It’s good for the airline industry to have regionals that can compete for business. If we all go out of business, the majors will not be well served by this. Our view is that we’d rather get the company back on its feet and grow the business. But we also realize the realities of the world and will look at our options. Mesa has been in business 30 years this year. What will Mesa look like five to 10 years from now? If we can work our way through the current changes, Mesa will be successful if we can renew our United and US Airways contracts, add new flying and open new relationships. That would be the ideal situation five years from now. Our United contract ends in 2015. We need to get it renewed, get the CRJ700 contract extended and find new business. That is my goal, but a lot can happen. But the worst thing that can happen is you lose all your money. The airline business is a tough industry. The last two years have been challenging. I’ve been around a long time, and I can’t say the last two years have been fun. When you love aviation the way I do, and have strong relationships with people in the company, I feel an obligation to people and to Mesa founder Larry Risley. I want to return Mesa to the point where we can call it a success. Wow, talk about a soft-ball interview! Not a single question about the myriad bad decisions made by Ornstein and his team that led directly to Mesa's bankruptcy. - Nothing about the failed China joint venture, how much money was lost, and why. - Nothing about the costs of starting and operating the unprofitable go! inter-island operation in Hawaii. - Nothing about the $52.5 million penalty paid to Hawaiian Airlines, or the costs of that litigation. - Nothing about the $2 million penalty paid to Aloha Airlines, or the costs of that litigation. - Nothing about the upstreaming of go! 's costs to Mesa. - Nothing about why go!, out of Mesa's dozen-plus subsidiaries, was uniquely excluded from Mesa's bankruptcy. - Nothing about why, after all these bad decisions leading to bankruptcy of a large, profitable and growing airline, Ornstein and his team remain in charge, with full salary and fat bonuses. Yes he got off easily. JO is universally hated by many pilots who have watched him become enormously wealthy while his businesses have exlusive contracts with Mesa. All that also dissappeared in the bankruptcy filing. He sunk millions into his GO venture in Hawwaii loosing millions yet kept his job. Amazing. Amazing how he can claim, " We had a misstep," " We made mistakes." The employment and lives of thousands of people have been damaged and destroyed due to the arrogance of one man. An individual who is literally without conscience or morality. When questioned in the past how his decisions have put people out on the street he simply shrugs and laughs, " hey that's the airline biz." Hitler took more responsibility for his actions than this guy.